Buying your dream home is fun and rewarding. We offer special incentives on many of our new homes for sale in premier communities. We also offer our Hero Program, an incentive to receive an incredible $1,000 incentive that can be used toward upgraded features at the Design Studio. * See a community sales representative for these promotions, incentives and more. Purchase any Definitive Home, use a preferred lender and receive your choice of one of these new home incentives: Slate Appliance Upgrade or $750 to Spend at the Design Studio! *Some restrictions apply, see sales associate for more information. 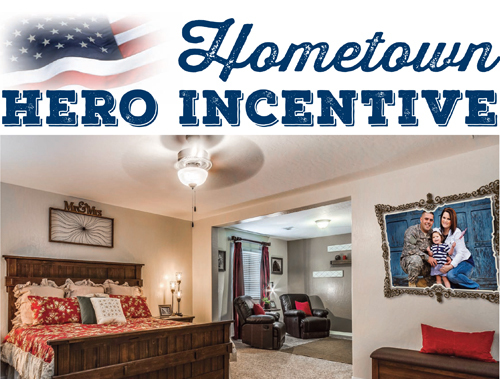 In appreciation for patronage and service, Definitive Homes offers an incredible $1,000 Hometown Hero Incentive that can be used toward upgraded features at the Design Studio. * *Restrictions may apply. See sales associate for more information.